Yes, it’s as bad as you thought it was. Maybe worse. That’s the unmistakable message about President Donald Trump and his administration from the early pieces of Bob Woodward’s chronicle — titled “Fear: Trump in the White House” — of the first year of the billionaire businessman’s presidency. The image Woodward casts of Trump is of a petulant child, deeply insecure about, well, everything. His staffers — from Defense Secretary James Mattis to chief of staff John Kelly and on down — spend most of their time a) keeping Trump in the dark for, in their estimation, the good of the country and b) running him down in meetings he isn’t in. Trump seems, by turns, annoyed by being left out of the loop and indifferent to it. And most importantly, the President seems entirely unaware of how incredibly out of his depth he actually is. Midterm elections are often cast as referendums on the current Presidential administration, and this year will be no exception. New polls show that Democrats have a clear and growing advantage over Republicans heading into November — a Washington Post/ABC News poll shows Democrats with a 14-point advantage on the “generic congressional ballot” — and more than 6 in 10 Americans say that President Trump and the Republican Party are out of touch with the rest of the country. President Donald Trump’s closest aides have taken extraordinary measures in the White House to try to stop what they saw as his most dangerous impulses, going so far as to swipe and hide papers from his desk so he wouldn’t sign them, according to a new book from legendary journalist Bob Woodward. 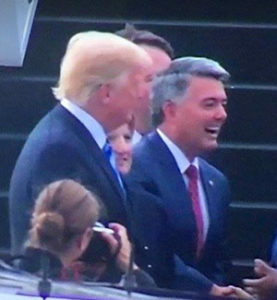 President Trump (left) and Sen. Cory Gardner (R-Yuma) in West Virginia last month. Republican candidates in Colorado who have embraced Trump should be positively terrified about Woodward’s new book. Republican gubernatorial candidate Walker Stapleton, for example, recently praised Trump for keeping America safe “in an admirable way.” Other Colorado Republicans in precarious spots in November — like Rep. Mike Coffman (R-Aurora) — have occasionally tried to parse their words on Trump but have generally been too afraid to anger the Trump base to do anything other than vote in lockstep with the President. For America in general, and Republicans specifically: Donald Trump, Fearless leader Fear This Leader. Liberals hate Trump, conservatives love Trump. Let's get out the vote and see who wins! We won't always agree, but I love our American system. Best of luck to you. Liberals want Trump to win. Everyone knows it. What a crock of pious b.s. from Moderatus. I'm a conservative and I DO NOT love Trump. We won't always agree, but I love our American system. Where "our American system" = "the white race." Yeah, too bad your beloved trump hates the system. I thought patriotism was a big deal to you guys? Oh wait, that's just for the flag. Always form over substance for you lot. 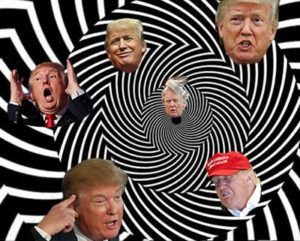 Let us not forget to spare a thought for the treacherous monsters who would support and defend this dotard to get what they want from government. They are all distinctly corrupt. Hack writer. Go Dog, Go is a better book." "Go Dog, Go" was probably the last book Trump has ever read. And that includes his own books. Didn't Dubya leave his copy of My Pet Goat in the White House library?